A typical stone built Tuscan farm house in a wooded hillside setting, dating back to the 1800’s, where a particular breed of swallow, called Rondoni, flocks to the house to nest in its eaves, hence the name. At 500 metres high, “I Rondoni” is situated between Florence and Arezzo, enjoying breath-taking views of the Arno valley dotted with Chianti vineyards, olive trees, cypresses and picturesque villages. A farmhouse for generations, I Rondoni has recently been restored to a high standard, retaining its rustic charm and authentic character. The house retains the original wooden roof beams and genuine old “cotto” floor tiles in several rooms. The traditional bread-making oven still works. I Rondoni has a fully equipped kitchen with marble work tops, dining room seating up to 10 people, 3 double bedrooms, 2 family bathrooms, a further 2 guest toilets, 1 jacuzzi, 1 large sitting room and a cosy lounge, 1 panoramic balcony, a stone-paved terrace overlooking the garden. Wi Fi network. I Rondoni together with 5 other stone houses clustered on the hillside is just 2 kms above the picturesque mediaeval village of Loro Ciuffenna. An enviable position with its own micro-climate, 500 metres high I Rondoni enjoys a gentle breeze which keeps you several degrees cooler on hot summer days than the valley below. I Rondoni is a convenient location to enjoy some of the most compelling Tuscan attractions: the Chianti region, famous for its wine tasting and olive growing, Florence, Arezzo, Siena, Cortona, Pratomagno Regional Park just to name a few. Typical Tuscan restaurants are easily reachable within 5-10 minutes drive from I Rondoni. So there is a lot to appeal to you whether you like country walks, history and culture or simply enjoy excellent rustic Italian cuisine. The fieste of the local villages celebrating religious and rustic traditions, provide an excellent opportunity for visitors to mix with locals, sharing traditional dishes and wines. Regular markets for food and clothes take place weekly in all the villages & towns nearby (see list below). There are also specialised antiques markets, most renowned being at Arezzo, which takes place over the first weekend of each month and several antiques markets are held in Florence, in Montevarchi (fourth Sunday), in Terranuova Bracciolini (second Sunday). Mediaeval Pievi (churches) are spread along the range of hills linking Florence to La Verna Abbey north of Arezzo towards the Romagna region. It is called the Pievi road which follows the route of the ancient Roman Etruscan road. The Pieve di Gropina, dating back to the year 774 is the perfect summer venue for music and cultural events just 3 kms from I Rondoni. From I Rondoni you can enjoy daily walks to suit your energy level from gentle strolls to strenuous trekking in the eastern hills of the Arno in the unspoilt Pratomagno National Park or in the west side of the Arno valley in the Chianti hills. Walks can be easy and relaxing if you chose marked paths that run among olive trees and vineyards as well as alongside the “Balze” which are argilla pinnacles created by the erosion of the Arno valley. These feature in the background of the painting of Mona Lisa by Leonardo da Vinci. Alternatively, you can chose more challenging marked paths up steep hills through woods of chestnut, pine, spruce and oak trees for a 5 or 6 hour hike up to the summits. Enjoy a game of tennis on a traditional clay court among olive trees and cypresses in a most tranquil setting, 5 minutes drive, can be booked with the local Church of Montalto in day and night time. Glasswork and leather crafted products were originally part of Tuscan history and have since developed in internationally renowned luxury brands available in the Outlets and Malls located a short drive away in Levanelle and Leccio. Children: 1 standard cot, 1 travel cot, small selection of toys, attachable chair (booster seat which attaches to dining chair), push-chair, children's table and chairs, paddling pool. The house is best suited either to very young babies or children above the age of 4 since there are no stair gates. Very nice villa with amazing views. The sunsets were beautiful overlooking the Tuscan landscape. Would definitely return for another stay when in this area again. I wanted a rustic Tuscan countryside villa, and Il Rondoni delivered. The villa, nestled among olive trees and vineyards, was spacious, very clean, with an amazing view. It is ideally situated to take day trips to the surrounding hilltop towns and wineries. After a day of touring, it was heaven to sit on the terrace with some wine and watch the swifts fly in to roost for the night and watch the lights come on in the villages in the valley. The home consisted of a kitchen, dining room, and half bath on the ground floor; sitting room, 3 bedrooms, and two full baths on floor 1; sitting room with fireplace on floor 2; then a few steps up from that is a jacuzzi room, half bath, and a balcony with an amazing view. All equipment you need to prepare your own meals is available. The coop in Montevarchi has anything you wish in the way of fresh-made pizzas, pasta you can cook yourself, and an array of prepared dishes ready-to-eat. The mountain drive is at first daunting, but soon we were driving it like locals. The owner, Riccardo, was responsive and helpful from initial queries to departure. Would I stay again? Absolutely yes! Delighted to hear you had such a wonderful stay. I would be really happy to welcome you again. Il Rondoni was just what we were looking for in a Tuscany villa adventure! We had a wonderful time! Gabriel met us in Loro Ciuffenna and took us up to the Villa which was quite an experience the first time! It felt like we were above everyone and everything else! The villa is rustic, but perfect for a relaxing vacation. After the crowds and bustle of Rome it was just what we needed! We had many great adventures, often visiting local villages or wineries that Riccardo had recommended for us. Thank-you for sharing your vacation home with us Riccardo - we will be sure to tell our friends. It was an amazing experience - one we will never forget! 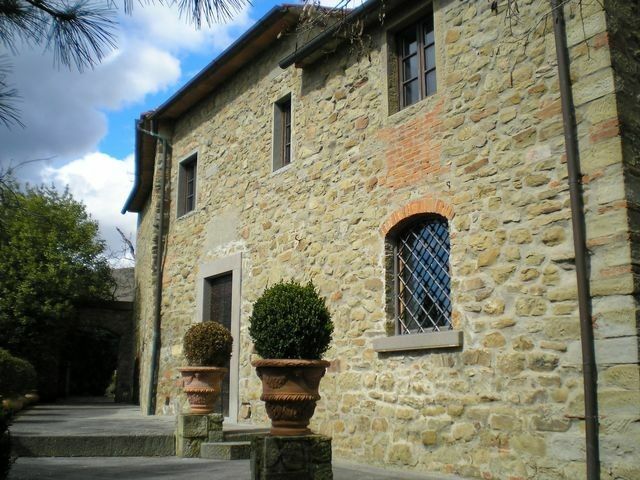 We enjoyed very much staying in this lovely old house overlooking the Tuscan hills and valley. It was relaxing and quiet. The nearest little town, Loro Ciuffena, is also lovely, and the region offers many opportunities. We were looked after well by Riccardo and Gabriele, Gabriele picked us up from the train station when there was a difficulty with our car on the first day. All much appreciated. Guests will probably need a car here, carrying food up the hill would be difficult. It is very nice to read how you enjoyed the peace of I Rondoni and felt very well looked after. Thank you for your lovely feed-back. A perfect piece of Tuscan beauty! Beautiful house. The stone walls, the beams, everything about it is beautiful! The little hamlet is quiet and isolated and very peaceful. The house itself had everything we needed. And the jacuzzi made it feel a little bit extra special! We were met by Sandro and his son who showed us the way and were very helpful getting us settled into the house. Please thank them for looking after us so well. A word of warning, the house is up a very steep, very narrow road which is a bit intimidating if you are from a city (like me!) but you get used to it very quickly. By the end of the week we were driving like locals! But if you are hiring a car, the smaller the better. And if you can hire a geared (manual) car, even better. We went for a lots of walks around the immediate area and on some of the little paths and the amount of wildflowers and butterflies and wildlife took our breath away. We spent every evening on the balcony watching the sunset and enjoying the amazing views. And we loved watching the swifts at night. Loro Ciuffenna is nice little town. Very easy to find if driving from the motorway. The whole area is well signposted. The bakery is especially nice and there are a couple of lovely food shops. There is a huge (absolutely massive!) supermarket in Montevarchi, again very easy to find, which has everything but I preferred going to the small shops in the villages. The gelateria in the town has lovely icecream. We only ate out once in Va' Pensiero but the food was gorgeous. The choices and the quality were fantastic. It is off a tiny little square but it is definitely worth finding. There are probably about half a dozen other restaurants too. The walk down to Loro Ciuffenna is about half an hour and 40 minutes back (it's uphill on the way back!) but it is such a beautiful walk that you don't even notice. Nearby the church in Gropina is worth a visit and is only 2 minutes from the town. We drove into Arezzo on a couple of days and loved it. It is a very nice city to visit. I would recommend this house and this area to anyone who wants a relaxing, peaceful stay in a gorgeous part of the country. Delighted to hear you had such a wonderful stay. It certainly sounds as if you discovered much of what the area has to offer. With pleasure I will pass on your excellent feed back to Sandro and his son Gabriele. When I was searching locations in Tuscany, I had a vision of the place and experience I wanted to share with my wife and friends. The I Rondoni villa exceeded all of our expectations. What is being said about the views of the Chianti Valley from the villa is absolutely true and you could spend the day sitting on the patio just watching the variations in the light as the sun crosses the sky. Our rooms were clean, roomy and very comfortable and the only sounds were of song birds. In the morning we sipped coffee and ate the breads, cheeses, meats and fresh fruits/vegetables available at the little Punta market on the way into town (try the local prosciutto!). If you need more than the basics, there is a larger market (The Uni-Coop) in Montevarchi that would send most epicureans over the edge with the selection of amazing fresh meats and produce available. There is also a large selection of wines and other liquors if needed and it is about 20 minutes away from Loro. There are a multitude of vineyards in the area (call to see when they are open), but really, the Chianti that is available at the Punta for 5-6 Euros will satisfy. The drive to the villa is a slightly narrow, but paved switch-back road that passes olive tree groves and small vineyards. The flowers were blooming during our time there and the smell of honeysuckle filled the air. From the villa there are several good walks, but my favorite leads to the chapel about a kilometer away. As for touring, Loro Ciuffenna is centrally located in the valley and the drive along the Chianti road is worth it. You can also get the train in Montevarchi if you want to travel to Florence, or the other larger cities. Riccardo, the owner, was excellent throughout the experience. Every question was quickly and kindly answered and we agree with the other reviewer in wishing we had the opportunity to meet him. A few notes for folks: there is enough room to park two "small" cars and having a small car would be an advantage when traveling the roads in Italy. I had rented a large van and another couple in our party had a small car and we were just able to fit them in the space available. There are neighbors, but they were very kind, quiet and very respectful of our privacy (honestly, you would hardly know they were there). We ate great food, drank excellent wine, laughed and had an amazing Tuscan home that we felt was ours own for a short time. Grazie Riccardo! I Rondoni sits on a Tuscan hillside between Florence and Arezzo, just 2 kilometres above the picturesque mediaeval village of Loro Ciuffenna, 7 Kms from the A1 motorway linking Florence and Rome. I Rondoni is a convenient location to enjoy the Chianti region, famous for its wines, olive oil stunning landscapes and exquisite cuisine. You can visit vineyards where you can taste before deciding which wines to buy. Interesting local villages throughout the Valdarno (Valley of the River Arno) include San Giovanni Valdarno, Montevarchi, Pergine, Figline Valdarno, Terranuova Bracciolini, Cavriglia, Incisa, Rignano all of which are within 10 to 30 minutes of I Rondoni. Each has a central square at its heart, with pedestrianised streets to explore full of boutiques, trattorie, churches, theatres, museums, exhibitions and fiestas. The rich diversity of country walking from the door of I Rondoni through the Pratomagno Regional Park and across the Chianti mountains on the opposite side of the valley brings many ramblers to stay at the house as paths range from easy to strenous. To the North of I Rondoni lies Florence and all its glorious sights: The Uffizi Gallery, Ponte Vecchio, Santacroce Church, Piazza Della Signoria, Leonardo da Vinci Museum, to name but a few. By car it takes 40 minutes from I Rondoni to Florence. However, the most convenient way to go is by train, as it only takes 25 minutes from Montevarchi into Santa Maria Novella in the centre of Florence. (Montevarchi is 12 Km from i Rondoni. Free car park is available at the Railway station in Montevarchi). 30 minutes drive South of I Rondoni is Arezzo with its splendid Piero della Francesca paintings recently restored in San Francesco Church and Piazza Grande famous for its antiques market. Siena with its shell-shaped piazza lies 1 hour west, Cortona with its Etruscan history 1 hour due south, San Giminiano, the hill top town famous for its towers 1.5 hours, Montalcino 1.5 hours, Volterra 1,5 hours. Rome is about 2 and half hours driving south.